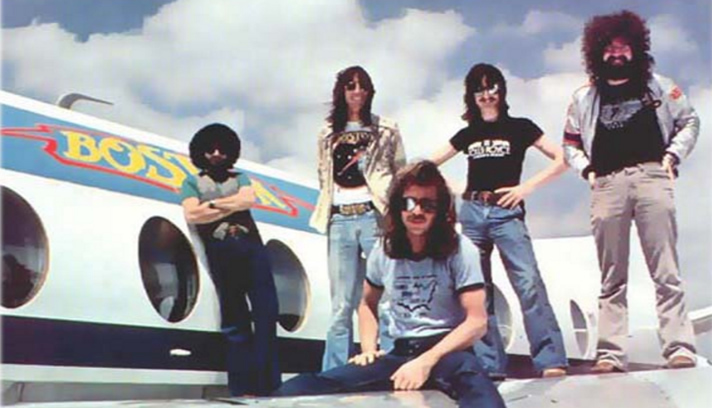 Although portrayed as a true “band”, Boston was really pretty much a solo project by engineer Tom Scholz. An M.I.T. graduate then working for Polaroid, Sholz built a home studio in Massachusetts in the early 1970s and began experimenting with innovative sounds and developing songs. Sholz formed a band called Mother’s Milk with singer Brad Delp and guitarist Barry Goudreau , but was soon unsatisfied with the live sound and disbanded the band in order to concentrate on the studio work (although Delp continued as the primary vocalist). A perfectionist, Scholz worked on the demos for about seven years, frequently submitting tapes to record labels only to be rejected. Finally, in 1975 Sholz got the attention of Epic Records who signed Sholz and Delp under a few conditions. They had to perform a live audition, which meant that a full band had to be assembled. Also, Epic refused Sholz’s request to use his demo tapes from home, insisting that all material come from a “professional studio”. It appeared the entire album had to be re-recorded and seven years of work scrapped. However, Scholz found an ally in producer John Boylan, who had the makeshift “band” doing sessions at Capitol Studios in Los Angeles while Sholz was back in Massachusetts finalizing his demos and transferring them to a professional, 24-track format. It was a very elaborate (and Expensive) diversion, but in the end it was well worth it. Aside from Delp’s vocals and most of the drum tracks, very little of the recordings from Capitol Studios was used in the final mix of the Boston album, which is all the more incredible when you consider the absolutely innovative nature of the album’s sound. Arriving in August 1976, Boston resurrected the classic rock format which seemed to be giving way to the new, divergent genres of punk rock and disco. Scholz’s innovative use of self-designed equipment would be reproduced and replicated throughout the subsequent years, especially the 1980s. While the fusion of hard rock with delicate motifs and layered melodies and harmonics had been done in the past by artists like Led Zeppelin, The Who, Yes, and The James Gang, it was mastered by Boston. If there is any any flaw in the Boston album it is that they got the sides wrong. While each side works well as a cohesive unit, the album should have started with side two, with the introductory “Rock and Roll Band”, and worked its way up to the fantastic side one, closing with “Long Time”. In this spirit, I’ve decided to review the second side first. “Rock and Roll Band” is an ironic song in that Boston never really was a “band” before the production of this album. The project started just with Sholz, Delp, and drummer Jim Masdea trying to recreate the recordings that Sholz was recording, but never really reaching any point of notoriety live. Masdea, who left shortly before the Sholz and Delp were signed to Epic, did perform the drums on this track but none others. When the record label insisted on a full band doing a live audition of the material, Sholz enlisted the rest of the players and the “band” was formed. Some may be led to believe that this beautiful song is actually about taking one’s life, especially in light of Delp’s suicide in 2007 (although Delp did not write the song). Closing out the second side, the album’s final two tracks are the closest to standard pop songs with standard subject matter. “Something About You”, although a fine song by any standard, is the closest thing to a throwaway song on this album as it is nothing spectacular compared to the rest of the material on the album. “Let Me Take You Home Tonight” is much better, a true pop song with the highest production value. It has a beautiful arrangement among the acoustic, electric, and organ parts and a very melodic bridge with a counter-melody. It all wraps up with an upbeat, revival-like coda section that fades to the end. 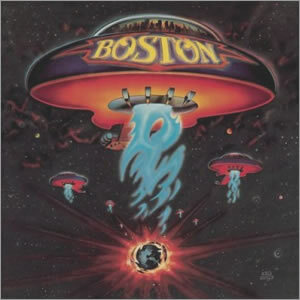 With a rather unique fade in which only serves to add more mystique to the song, “More Than a Feeling” the first song on the first album, is the greatest song Boston would ever create. It is a perfect rock song in many ways, beginning with a pleasant acoustic folk riff that launches into an incredible rock riff linked by a short, space age guitar lead previewing the fantastic harmonized electric guitar of Tom Sholz. The most fantastic item in this department store full of ear candy, Sholz would go on to patten this sound with the development of the Rockman. In “More Than a Feeling”, the guitar lead is played over a quite complex yet totally melodic progression, with the final note seems to sustain into infinity under the vocals of Brad Delp vocals in the final chorus. The song itself took five years for Sholz to perfect and his diligence sure paid off. An acoustic intro betrays the hard rocking tenor of “Peace of Mind”, a commentary on work/life balance. Here Delp’s harmonies shine brightest through the choruses and there is also some great bass by Sholz, proving his talents on yet another instrument. On “Foreplay”, the album’s oldest piece, Sholz plays the organ and clavichord in a space age instrumental consisting of rapid triplet arpeggios played on a Hammond M3 organ. All “effects” were performed on guitar by Sholz, as the band swears that not a single synthesizer was used on the album. “Long Time” is the perfect closing song, starting with a great lead guitar which pierces through the very basic rhythm by the organ and bass as the song kicks in and accents each verse nicely. The choruses switch up and are dominated by a strummed acoustic guitar and what sounds like an electronic hand clap. But even with this radical departure, the song flows perfectly from one section to the other. Boston became the most successful debut ever by an artist and remained so for over a decade, selling a million albums in less than three months and nine times that figure over its first decade. The band would put out a similarly-styled follow-up with Don’t Look Back two years later, but Sholz felt that effort was “rushed” and it did not fare nearly as well critically nor commercially. In reality, Boston would be that unique super nova by the band which could never be replicated. It was also the rare piece that was extremely excellent, extremely popular, and has held up over the decades, and that is what makes it Classic Rock Review‘s album of the year for 1976.